HomeBizarreMost PopularThis couple’s wedding venue sped away minutes before the ceremony! This couple’s wedding venue sped away minutes before the ceremony! 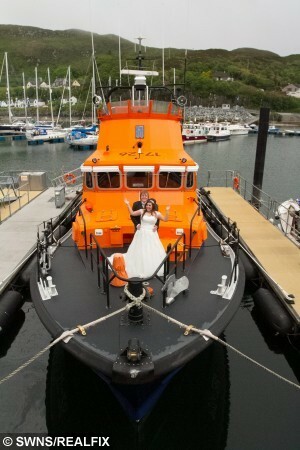 A couple were forced to tie the knot on a harbourside – after the LIFEBOAT they were due to get married on was called out to an emergency. Sophie Anderson and Richard McWhirter hoped to exchange vows on the raft. But just minutes before they were due to tie the knot, the RNLB Henry Alston Hewat was called to a stricken yachtsman, leaving the couple on the harbourside. Instead the loved-up pair were forced to hold their ceremony on the dock near the station in Mallaig, in the Scottish Highlands. Richard, 29, a music teacher from Buckie, Moray, said: “It was an absolutely brilliant day. “We ended up not actually getting married on the lifeboat as it was called out. “We were right by the side of the harbour, where the lifeboat is docked. The guests were very content. Richard and Sophie, 30, initially hoped to get married on the famous Jacobite steam engine at Glenfinnan viaduct, which features in the Harry Potter films. 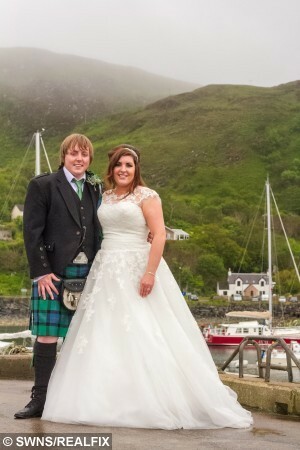 It holds a special place in the couple’s hearts, as they took the 84-mile round trip from Fort William to Mallaig shortly after falling in love. But when they were unable to book a slot, they looked for an alternative venue for their 35 guests and the lifeboat station in Mallaig, Lochaber came to the rescue. The couple were warned in advance there was a chance they’d have to relocate should an emergency call come through. And the lifeboat was called to a lone yachtsman with engine problems going into one of the sea lochs on Saturday morning – and didn’t return for four hours. Michael Currie, lifeboat coxman said: “It’s the first wedding request we’ve had. “We were quite looking forward to it but there you go. “The boat was all polished up and we were going down to get organised. “I was sitting having my cup of tea and then the next minute the pager goes and that was it. “I think they had a good day. They just got married on the pier and the sun came out for them. The couple now intend to go back to work for two weeks before jetting off on their honeymoon to Sri Lanka and Thailand. « Previous post This mum didn't think she needed to diet - until she broke everything she sat on..